Ado-Ekiti-The Director General, Buhari/Osinbajo Campaign Council in Ekiti State, Dr. Olusegun Osinkolu, has expressed worry over the anti-party activities being displayed by some governors of the party, describing it as “unfortunate and worrisome”. 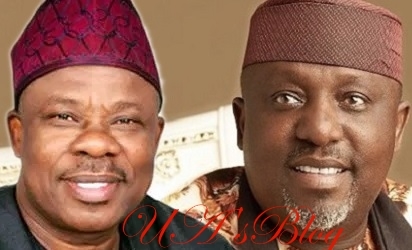 Osinkolu said the crisis and division in the party in Ogun and Imo stares due to Governors Ibikunle Amosun and Rochas Okorocha’s alleged opposition to the candidature of the APC governorship candidates, Mr. Dapo Abiodun and Senator Hope Uzodinma could affect the fortune of the party and reduce its votes for President Muhammadu Buhari in the presidential election. He said cases of alleged anti-party activities were also being levelled against some other governors in the southwest region, he described as pivotal to the survival of President Buhari in the February 16 election. Amosun is backing the candidate of Allied Peoples Movement (APM), Hon. Abdulkadir Akinlade for the March 2 governorship election, while Okorocha is supporting Uche Nwosu of the Action Alliance. This was said to have affected the presidential campaign rallies in both states, where President Buhari was put in a very uncomfortable position and that of Ogun almost developed into a full blown violence. Speaking with journalists in Ado Ekiti on Wednesday, Osinkolu said : “We are worried that our members go as far as trying to stone a whole president. I am seeing a lot of anti-party playing out here in the southwest and it is not going to be in our interest. “But the bulk stops on the table of Governor Amosun, because he ought to manage that situation better being the Chief security officer of the state. He didn’t handle the issue very well. “Whether you are a president or governor or holding any other position, the party is supreme, because the crisis was a fallout of the primary. Governor Amosun must repent and change his ways, because southwest is important to APC in these coming elections”, he warned. He commended the APC National Chairman, Com. Adams Oshiomhole for displaying ingenuity in crisis management for the party to be largely united, adding that the party could have been more polarized but for the party’s strong leadership. Osinkolu expressed confidence that the party will win in Ekiti based on Governor Kayode Fayemi’s superlative performances in the last four months. “Within the last four months, Fayemi has boosted APC’s electoral fortunes through regular payment of salaries and pensions . He abrogated the development levy in public and private schools and introduced true and genuine free education. He approved a sum of N200m car and vehicle loans for teachers. “Just on Tuesday, the governor met with teachers and canvassed for votes for President Buhari. So, our projection to get the nine National Assembly and 26 House of Assembly seats can be realized. The governor now relates well with the people and it will help us in getting more votes for Mr. President”. Osinkolu appealed to former governor Segun Oni not to proceed to the supreme court, having failed to nullify Fayemi’s victory in the eligibility suit he filed at the lower and appeal courts. The APC chieftain advised that Oni as leader must be more preoccupied with how to stabilise APC in Ekiti , than taking steps that could divide it further. He called on the security agencies to arrest those found to be launching attacks on members of political parties at campaign rallies for Ekiti to be at peace. No fewer than 20 persons were macheted on Tuesday in Omuo Ekiti, Ekiti East local government, when the supporters of the senatorial candidate of the Peoples Democratic Party (PDP) in Ekiti South, Senator Biodun Olujimi clashed with that of her opponent in APC, Prince Dayo Adeyeye.